I’m not on a diet. I am choosing to eat a certain way. I am choosing to change my life. I don’t miss cheesy pizza. I don’t miss pecan pie. I don’t miss feeling stuffed and kludgy. I have fewer mood swings. I do feel hungry sometimes and that’s ok. It’s normal. And I will survive. I want to have a better life and I’m making choices to make it better. There’s no way to “cheat” because then I would be the cheated-upon. I don’t care what you eat or don’t eat. I just want you to understand that you don’t have to feel bad for me, hide what you’re eating from me, or express pity for me. I’m fine. I feel happier about food than I have in a long time. This is a path I want to be on. PS Down 13 pounds in 5 weeks. That salad looks delicious. Good for you! There’s another kind of pico de gallo than the raw salsa we eat. 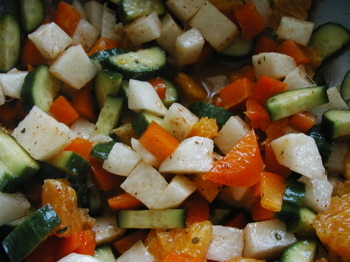 It’s a salad of jicama, orange slices and sweet onions with an orange-chili vinaigrette. I threw some persian cucumbers in, too. It is good! Too many underestimate the difference truly good (health) food makes to overall mood and health. I love that you reiterate that it’s a choice, a personal one at that. Thanks, Patrick. I heard the phrase “eating right” yesterday and I really GOT it for the first time. It was simultaneously a revelation and a “DUH” moment. I think this is one of those things that has to be a revelation. You can’t get there by other people telling you. And once you do get there, it seems kind of simple, and you wonder how you didn’t get it before. Congrats! That salad looks amazing. I’m adding it to the menu for the new years feast! So of course after writing that, I went on a trip for 3 days and finished it with a dinner that involved pasta cooked with brown butter. But today I’m back on the fruit and veg train! Onward. Your post today really resonated with me. I struggle with the pity party “I feel deprived” thing. Your post really helped me reframe that. I’ll be visiting your blog a lot as I stuff my face with kale and apples in the coming year. Thank you for that encouragement. I struggle with knowing how much to post about this because I always find it boring when people go on a diet and get all preachy. But I had been thinking about the ways some of the people in my life have reacted and I just had to write through it.